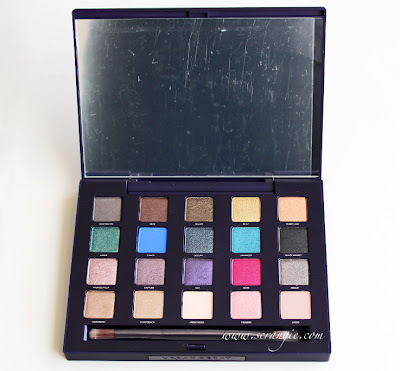 I'm sure by now everyone's seen Urban Decay's newest palette. I'm sure most of you even bought one during last week's friends and family sale. 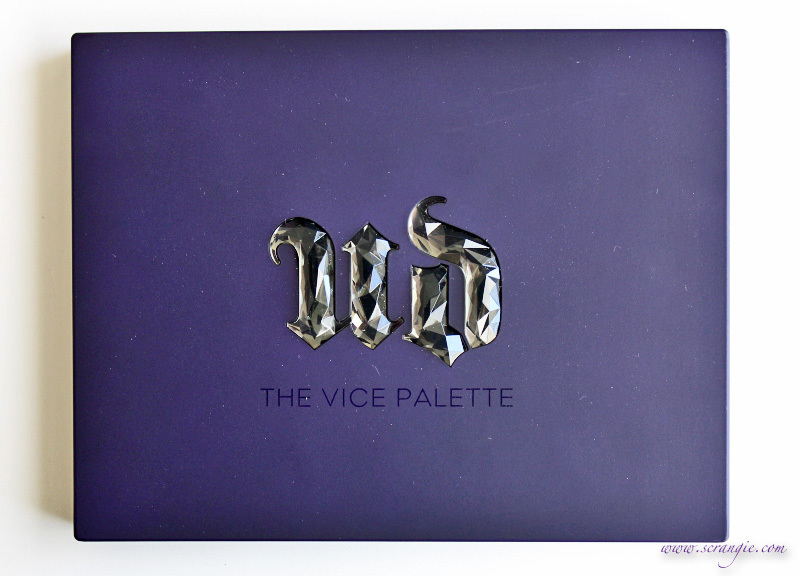 But for anyone who hasn't seen the incredible new Vice palette by Urban Decay, here's my take on it. This time the case for the palette isn't cardboard and there aren't any pull-out drawers. 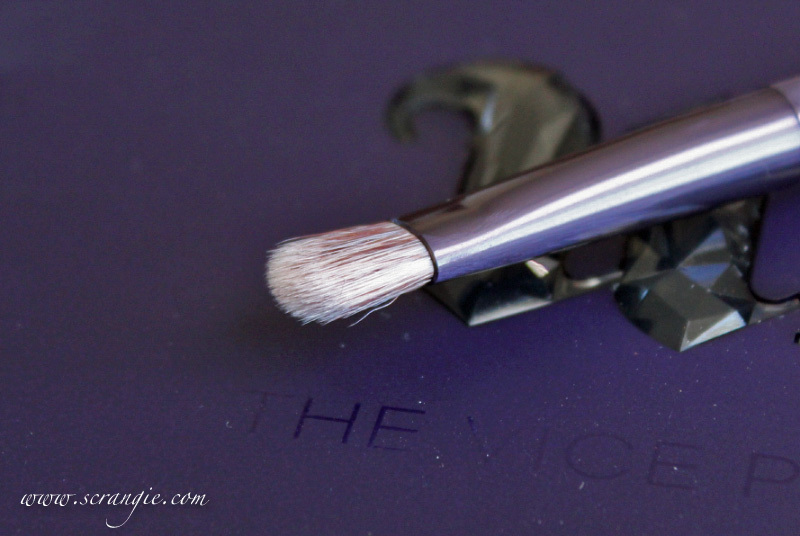 It's a solid, rubberized purple plastic with a gem-like smoky crystal Urban Decay logo. With the press of a button, you can flip up the lid of the palette (and this lid actually stays open) to reveal a full mirror, 20 palette-exclusive shadows and a full-sized, double-ended eyeshadow brush. The other side is a flat lid/shading brush. 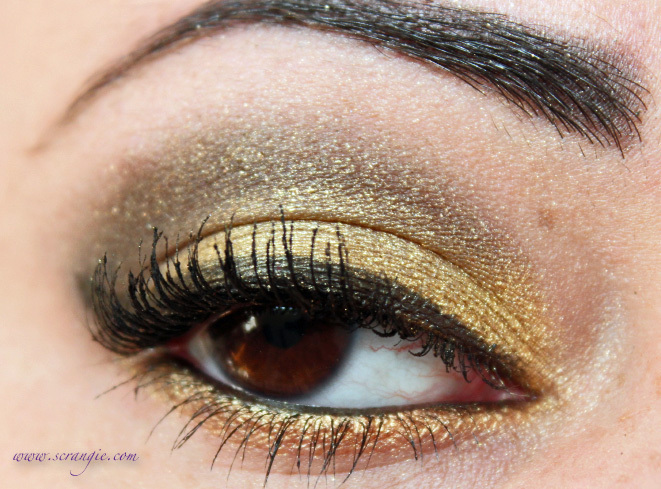 Super easy 2-minute look using Blitz on the lid, Jagged in the crease, Penny Lane on the lower lashline and Anonymous on the browbone. The formula on nearly every shadow is perfect. 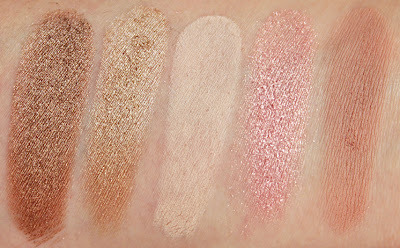 Creamy-feeling, pigmented, nicely blendable. The shadows are perfectly pigmented on their own, but can also be used wet for an extra boost of color, shine and sparkle. 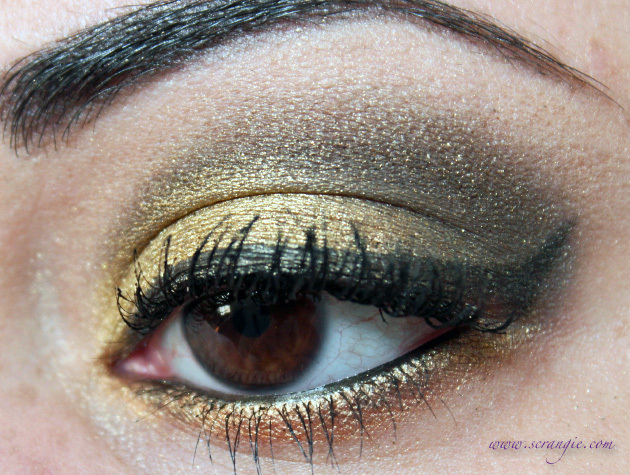 The metallic shades look amazing used wet. The packaging is sturdy and attractive. The included brush is regular Urban Decay brush quality and is very convenient for travel. Some super gorgeous colors in here! Palette included a black, a perfect neutral matte highlight, some sparkly shades, some neutrals, some brights; it's extremely versatile and has practically every color you need to create a wide range of looks. The way the colors are arranged is really appealing to my eye. 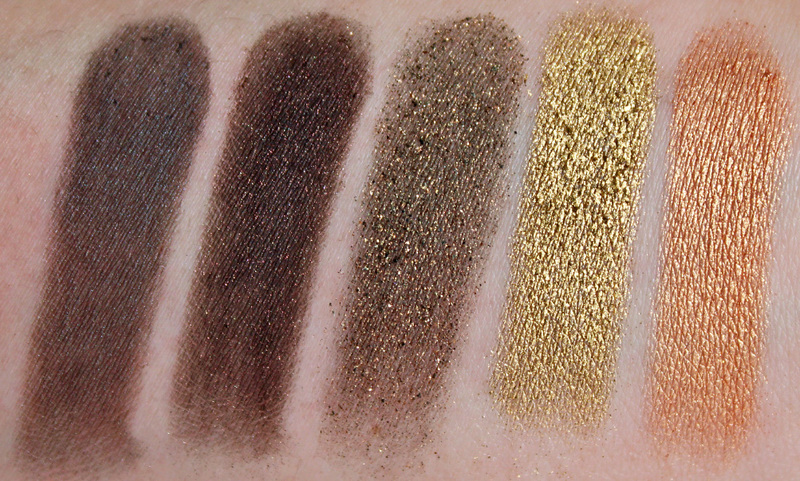 The shadow colors are all exclusive to this palette. No duplicates! 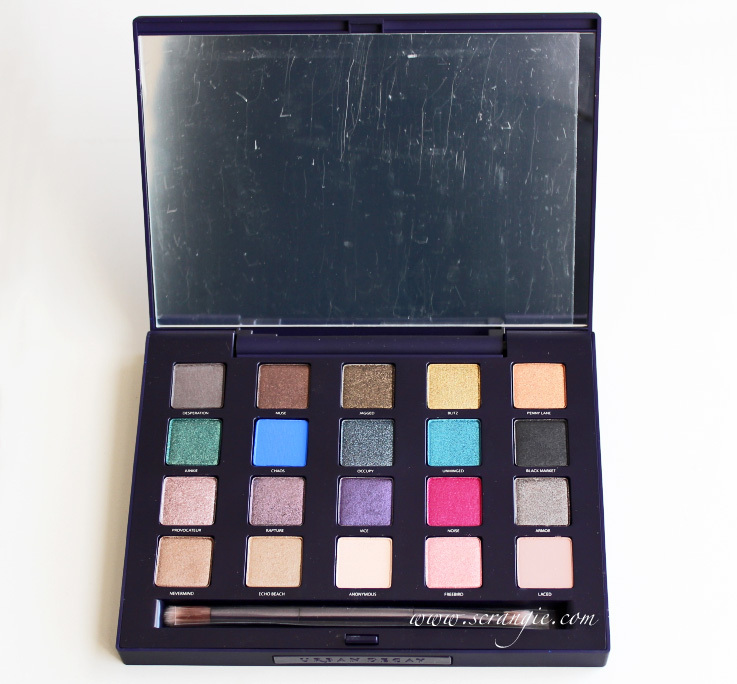 Though some of the colors do look suspiciously similar to existing Urban Decay colors. Some of the colors aren't as pigmented as I had hoped they would be. Chaos (the bright blue) and Noise (the bright pink with glitter), the two colors I was looking forward to the most, are the least pigmented. 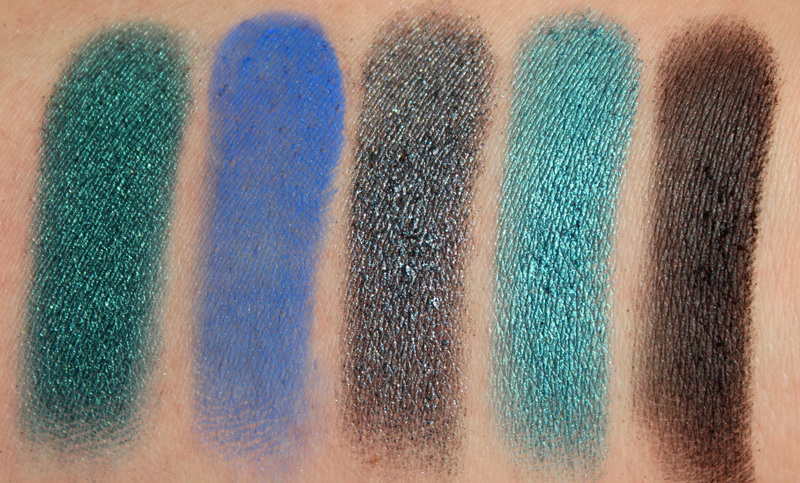 Some of the colors are a dark base with a glitter-type shimmer, so they look different on the skin than they do in the pan (Jagged, Occupy, Junkie). 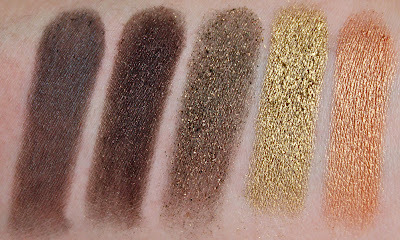 The glitter shades, even though they are the new and improved Urban Decay shadow formula, do still have glitter fallout. It's better than the old formula used to be, but the glitter fallout is still not completely eliminated. The rubberized palette attracts dust and fingerprints from the very first time you use it (think NARS' rubberized palettes). The bristles on the crease/blending end of the brush are (for me personally) a little too floppy for crease application, but this makes it nicer for blending. I prefer a stiffer brush for crease application. In my humble, unhealthily makeup-obsessed opinion, this is the best palette Urban Decay has released by far. I've bought almost every single palette Urban Decay has ever done, and none of them wow me like this one does. None. 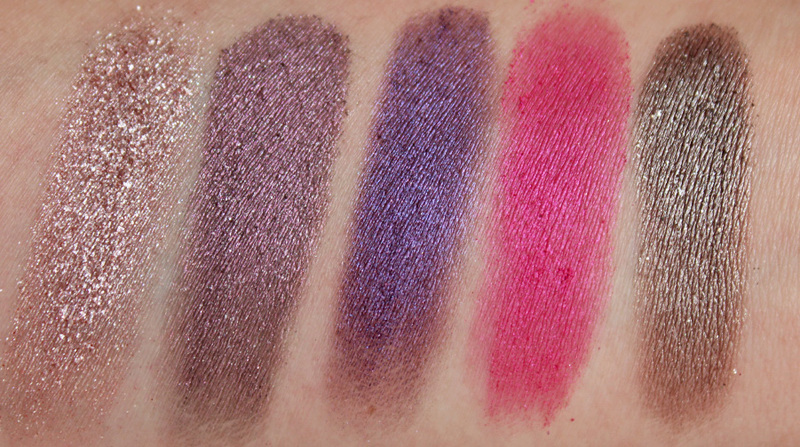 The only other one that comes close for me is the Alice in Wonderland palette. 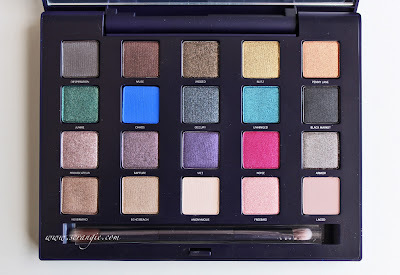 I think Vice has the perfect variety of colors, ideal shadow formula, a good (and useful) brush, and nice, sturdy packaging that isn't going to get beat up and dented like the cardboard Book Of Shadows ones. There are so many amazing colors in this palette and they all seem to complement each other. I'm very happy with the Vice palette. I would definitely recommend it. The Urban Decay Holiday 2012 Vice Palette retails for $59 and is available now on urbandecay.com (where I ordered mine) and Sephora.com. I've been playing with this palette for a couple of days and I have mixed feelings about it. 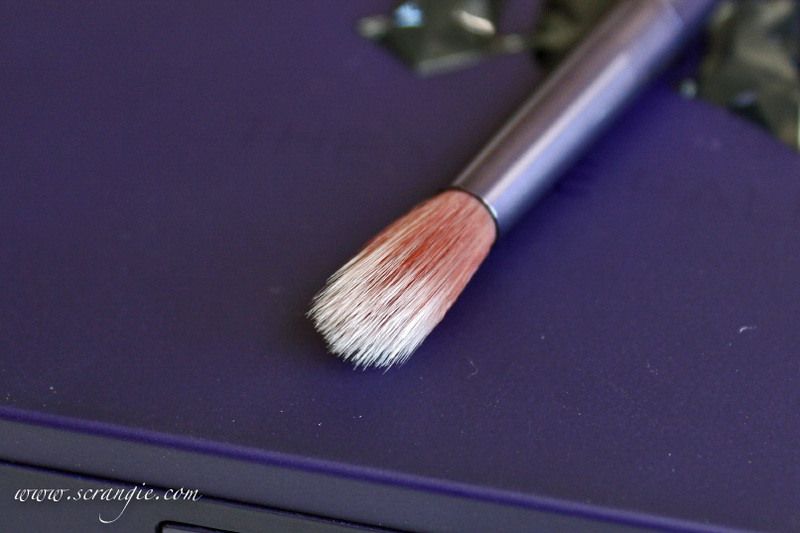 The brush is really really bad, I'd never spend a penny on UD brushes, now that i know how bad they are. It's weird to hear that Chaos seems the least pigmented cause in my palette it's one of the most vibrant and pigmented shades. Doesn't swatch well but on my lids it's lovely! Now that you've had more time to test it out. How do you feel about it. Really curious to know. 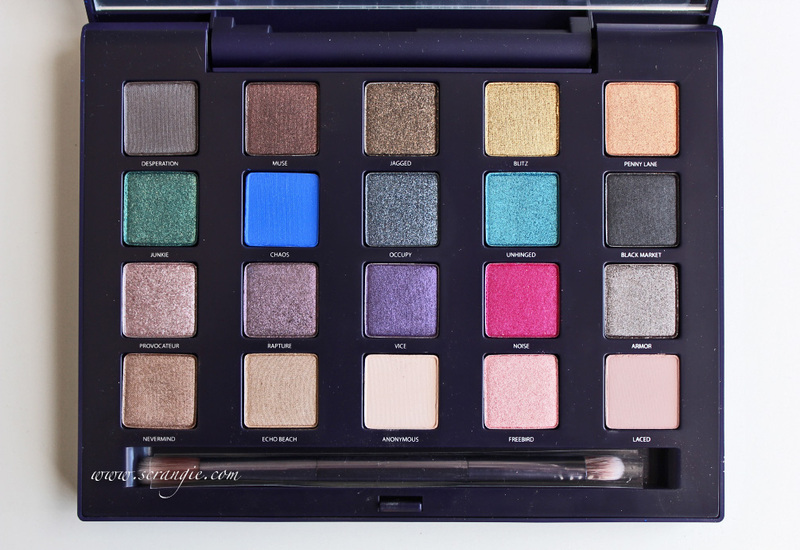 I'm debating between this the smash box master class and urban decay sweet indulgences for my first palette. Gorgeous palette! I've never been tempted to buy an Urban Decay palette - but this palette is seriously making me droool with envy! Scrangie you're a temptress. I was sure I didn't need it, but you made me change my mind. 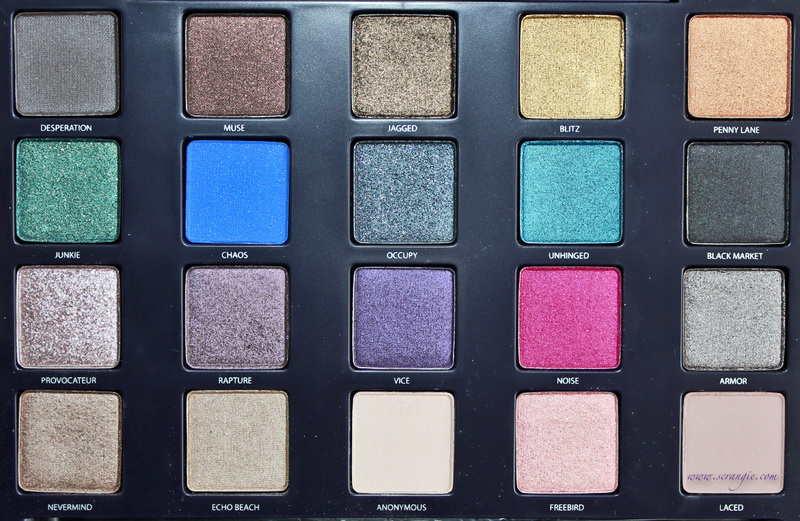 It's stunning.... Urban Decay is always surprising me by quality. I think I need this next week with my 20% ULTA coupon. I Like the packaging but I think I will skip this palette has I already own similar colours. 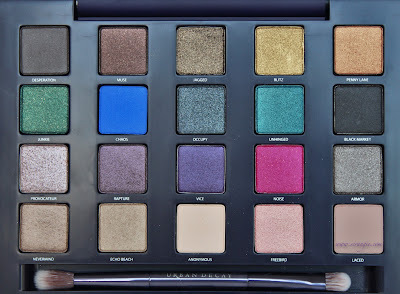 I'm really impressed by this palette as well. I have a couple UD palettes (Naked, Naked2, Anniversary, Smoked and Vice). While I use both my Naked palettes a lot, I like the variety that the Vice offers. Some of the non-neutral shade are subtle enough to wear for work (I love Rapture), but also enough shades to make make-up fun. For the glitter-type shades, I recommend using the TF glitter glue as a base and use a flat brush to apply the eyeshadow. 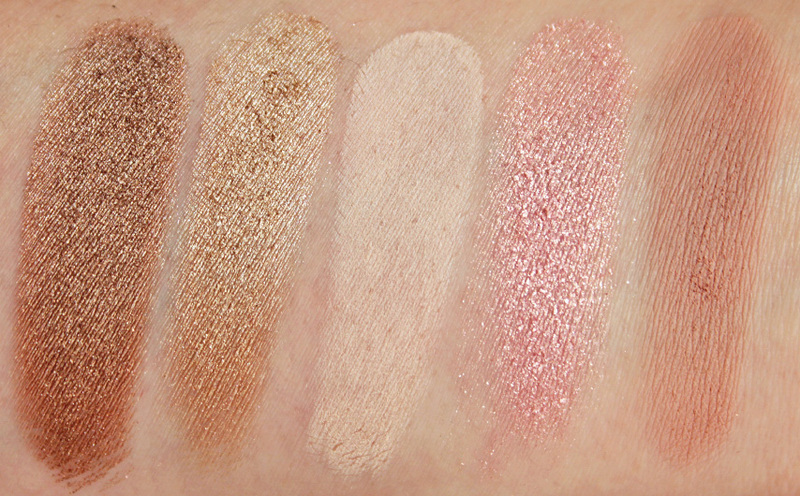 I love this palette - it is so pretty. 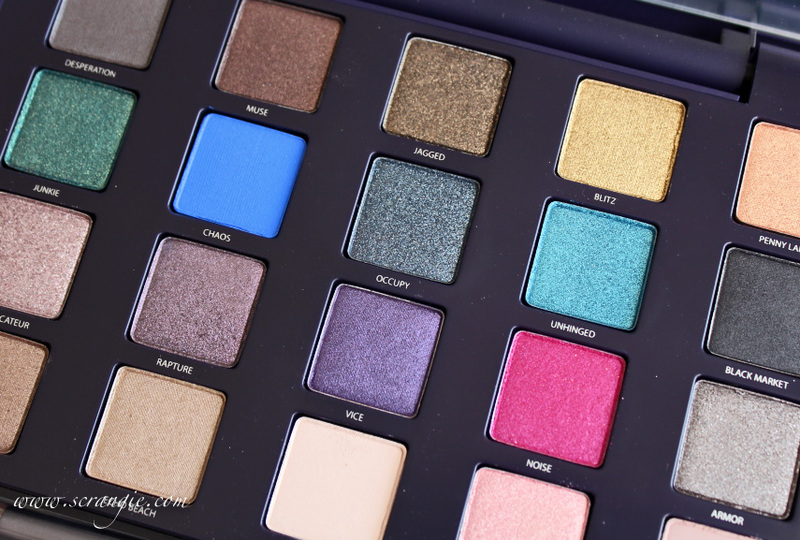 I love Urban Decay's choices of eyeshadow colors and the packaging is to die for! You find URBAN DECAY shadows sheer?! I sure as heck would like to know what sort of shadows you like to buy--the pigmentation of your shadow arsenal must be out of this world! Scrangie: it's so funny that you mention how happy you are with this. When I saw this in person, I thought, "Looks very 'Scrangie' to me." I couldn't really justify that thought until I read this review though. Maybe I'm unhealthily addicted to beauty blogs if I can guess what my fave beauty bloggers would like. I may love color but just not as crazy about glitter as you are--scratches my sensitive eyelids too much. But it is thanks to your influence that I now happily wear glitter polish. Any recommendations for a nice huge colorful palette but has no glitter? (Maybe it's odd to ask you, but glitter IS something you'd pay attention to, so you might know what does NOT have it) Thanks! Ooh! I know just the one! Ben Nye Lumiere Grande color palette. It's not huge (only 12 colors), but it is supremely colorful, top quality and NO glitter. It's one of my most used and cherished palettes of all time. It's mostly brights with some white, silver and gold, so it doesn't have the neutrals and highlight colors like this palette has. The brights in it are awesome. What a pity they aren't as opaque as they could have been, I'd still like it though. The rubber finish was one of the things I dislike about the Nars packaging, it picks up every bit of fluff and powder, only looks great for about a day. 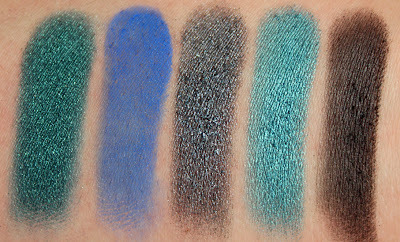 Thanks for the eye swatches, I love to see how you do that. Nice colors, and look very pigmented! Have it and totally love it! I even reviewed it on my youtube channel (not gonna link it, don't worry). It's super pigmented, stunning colors. I agree with your conclusion! This one has more variety compared to the 15 palette. I do like both, but I definitely prefer this one. More finishes, more color families, it's not ALL frosty with tons of neutrals. The packaging isn't as pretty as 15, but it's more functional because it snaps closed.